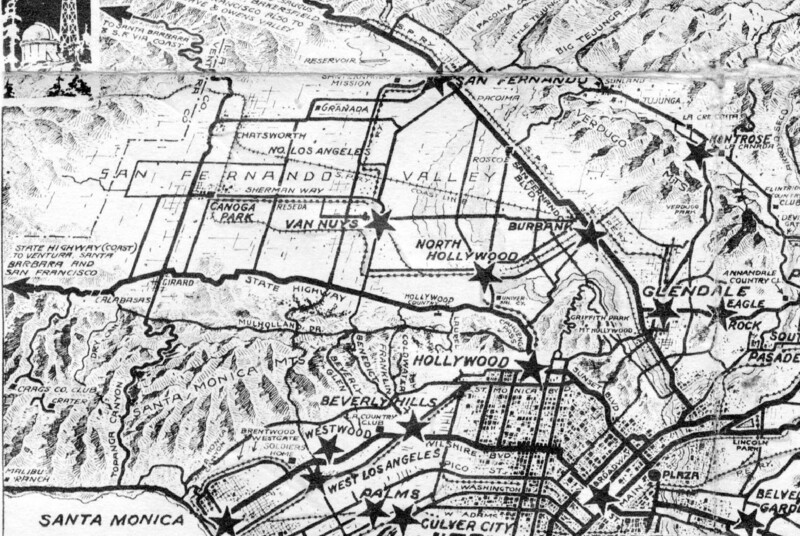 Van Nuys was established in 1911, and soon after people settled here to work and live. The Southern Pacific freight trains ran along tracks which are now the location of the Metro Orange Line. 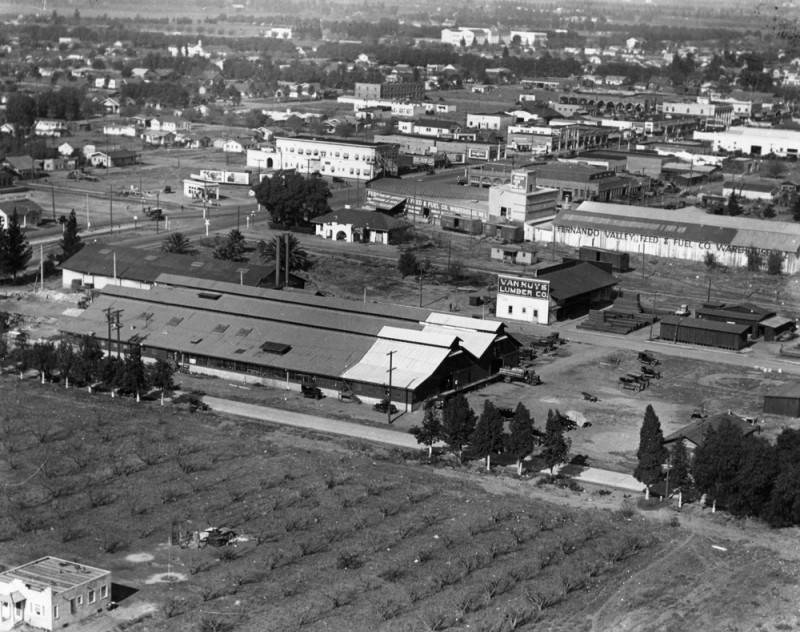 An agricultural economy supported citrus packing plants, animal feed for horses, cows, chickens; and the burgeoning development of the San Fernando Valley brought lumber suppliers to Van Nuys. 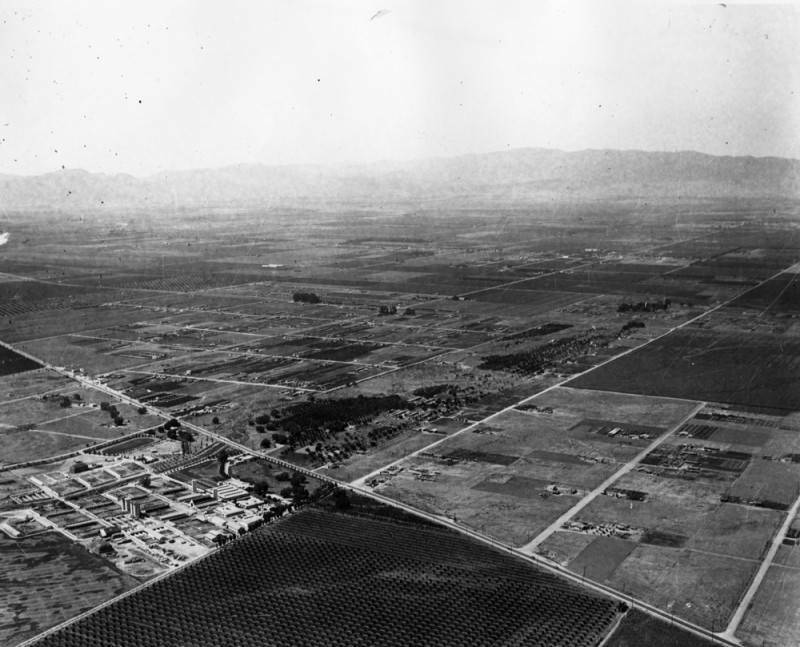 These 1924 images of Van Nuys come from the Los Angeles Public Library Archives. In the first photo below, we are standing near Oxnard and Van Nuys Blvd. looking north with the train tracks and crossing signals visible in the middle left side. The town has the air of a farming village with rows of fruit trees planted and open space between structures. In the very top of the photo one can make out Van Nuys High School which was badly damaged in the 1933 Long Beach earthquake and rebuilt in an Art Deco style afterwards. In the second photo, below, we are flying over the area near Oxnard and Van Nuys Bl. looking NE towards the site of our present day government buildings. Small, humble houses dot the landscape immediately adjacent to the industrial area along the rail tracks. Van Nuys Lumber Co. was probably located on Aetna St. one block north of Oxnard. One can also make out small rows of pitched roof dense houses in the middle right area. Perhaps these were “worker” housing for the people who loaded the trains, and did the manual labor which was required to move goods from Van Nuys to the freight trains. 2018: Aerial View of Oxnard at VNB looking NE. 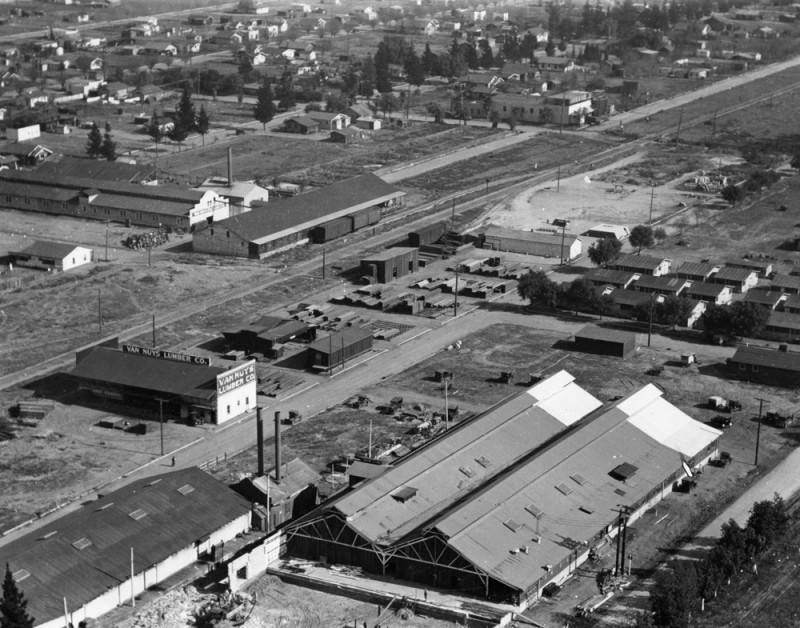 In the third image, below, from 1925, we have an overview of Adohr Dairy Farms (18000 Ventura Bl) and Runnymeade Poultry Farm. This is in Encino west of White Oak. Photo below: Adohr Farms, 1937. Notice unusual udder-shaped topiary along road. I believe you mean the 1933 Long Beach earthquake which damaged schools all through Los Angeles ultimately resulting in the Field Act mandating that school buildings must be earthquake-resistant. Yes. Thank you for the correction my error. ← 11 Ideas to Improve Van Nuys.